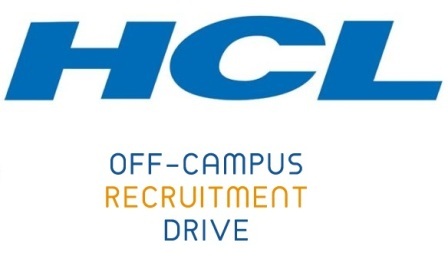 HCL Off Campus Drive 2019: Here is the HCL Off Campus Drive Registration Link for Freshers. HCL Technologies Limited is a multinational Indian company based in Noida. HCL has currently 24 offices in India. HCL off-campus drives will be conducted at various locations/ colleges and universities for this year 2018-2019. So the freshers are advised to be prepared and get ready to face the HCL recruitment. Freshers who have completed their full-time course in BE, BTech, Degree, MCA, M.Tech, M.Sc (CS/IT), BCA, B.Com, BA / any Graduate are eligible for the off-campus drive conducted by HCL. During the time of registration process for fresher jobs, keep your all mark sheets in hand. Also, you need to carry the Xerox copies of all your mark sheets, Identity proof, photographs, and resume to the off-campus drive. If you want classroom training by HCL on technical and communication skills then you can choose HCL-TSS (Training and Staffing Services) program offered by HCL technologies. This is a self-paid program, after successful completion of this program offers you a job at HCL Technologies. Applicants interested in an IT career at HCL can enroll in the fee-based training and recruitment programs. HCL TSS offers training programs for students who have completed class 12th / Intermediate, science graduates, and engineering / postgraduate graduates. The recruitment process for this program contains counseling, online exam, HR & technical interview. Program duration is from 3 months for BSC & BCA, 6 months for 12th pass outs only and 6 months for BE, BTech, MCA, ME/M.Tech, M.Sc (CS/IT).